The Gulf of Aden is located in the Indian Ocean between Yemen on the south coast of the Arabian Peninsula and Somalia in Africa. In the northwest it connects with the Red Sea through the narrow Bab el Mandeb strait. The strait may well have been the route taken by early humans emigrating out of Africa to populate the rest of the world. The Gulf of Aden is an essential waterway for Persian Gulf oil, making it very important for the world economy. But it has been a part of world trade since ancient times, when Arabs, Greeks, and Romans used it to travel to Asia. With relatively low pollution levels, the gulf has many varieties of fish and coral. The main ports are Aden in Yemen, and Berbera and Bosaso in Somalia. The Socotra Archipelago, part of Yemen, is noted for its biodiversity and species endemism. Over one-third of its plants are endemic to the archipelago, making it one of the top ten island groups in the world in terms of endemism. Many of these endemics are remnants of ancient flora that long ago disappeared from the African–Arabian mainland. The port of Aden, on the north shore, has been the site of terrorist attacks, including the bombing of the USS Cole. Acts of piracy are regularly committed against yachts passing through. The Gulf of Aden, an arm of the Indian Ocean that runs in a west-east direction, is located between Yemen on the south coast of the Arabian Peninsula and Somalia and Djibouti in Africa. In the northwest it connects with the Red Sea through the Bab el Mandeb straits, making it strategically important. The port city of Aden at the tip of the Arabian Peninsula lies on a major world trading route through the Suez Canal. It is one of the largest natural harbors in the world with an area of about 70 sq. km of sheltered water. At the western end, only 12 miles (20 km) separate the coast of Djibouti and Yemen, though it is 500 km wide at the eastern end, between Ra's Asir of Somalia and the city of al-Mukalla of Yemen. It is about 900 km long. The Bay of Tadjoura juts into Djbouti at the western end. Monsoon winds blow from the southwest from May to September and from the northeast from November to April. The Gulf of Aden is strongly influenced by the upwelling of cool, nutrient-rich waters during the southwest and northeast monsoons and is characterized by a prevailing high-energy climate. These pose major constraints on coral reef development; hence, only five percent of the Yemeni coast is lined with fringing reefs. Rocky cliffs alternating with long stretches of sand along coastal plains dominate the coastline. Some of the sandy beaches form major nesting sites for green turtles in the region. Little is known about the coastal and marine resources of the coast of Somalia, although recent visits have revealed the occurrence of previously unknown coral reefs and mangrove stands. At the eastern extreme of the Gulf of Aden, the Socotra Archipelago, which is part of Yemen, is of global significance for island biodiversity and species endemism. Over one-third of its plants are endemic to the archipelago, making it one of the top ten island groups in the world in terms of endemism. Many of these endemics are remnants of ancient flora that long ago disappeared from the African–Arabian mainland. Unlike many island groups, Socotra has remained virtually untouched by modern development and there is no evidence of recent extinction or large–scale changes in the vegetation. The marine environments of Socotra Archipelago remain largely in a pristine state, unaltered by coastal pollution or over–exploitation. About 130 species of coral reef have been reported in the southern Red Sea and Gulf of Aden. There are extensive mangrove stands in the Red Sea and Gulf of Aden, especially in the southern Red Sea. Mangroves are an extremely important form of coastal vegetation: their extensive root systems stabilize sediments and protect the coastline; they provide shelter for an array of marine animals and birds—enhancing overall biodiversity—and the juveniles of commercially important fish and crustaceans. Djibouti, which lies at the junction of the Red Sea and the Gulf of Aden, has a coastline about 370 km long. The northern coast between the Eritrean border and Ras-Bir faces the narrow Strait of Bab al Mandab. Most of the coastline of Djibouti lies along the narrow Gulf of Tadjourah, an east-west oriented trench with a maximum depth of 883 m. A shallow but narrow opening separates it from the semi-enclosed basin of the Goubet al-Kharab, which has increased salinity and coral reefs of low species diversity. The coral reefs are mostly fringing. With similar conditions to those prevailing in the southern reefs of the Red Sea, the reef of Djibouti is very turbid. On the south coast, close to the border with Somalia, the effects of upwelling nutrient-rich water begin to be discernible in fish assemblages. Water there is very turbid and the reefs poorly developed. They support fewer species and lower abundances of reef-associated fish than reefs further north. Non-reef species are more abundant, however, and this area represents the main fishing ground in Djibouti. The Bab-el-Mandeb, meaning "Gate of Tears" in Arabic, is the strait separating the continents of Asia (Yemen on the Arabian Peninsula) and Africa (Djibouti on the Horn of Africa). 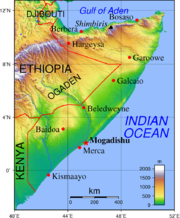 It connects the Red Sea to the Gulf of Aden and is sometimes called the Mandab Strait in English. The strait derives its name from the dangers attending its navigation, or, according to an Arab legend, from the numbers who were drowned by the earthquake that separated Asia and Africa. It is one of the world's busiest shipping lanes. The distance across is about 20 miles (30 km) from Ras Menheli on the Arabian coast to Ras Siyan on the African. The island of Perim divides the strait into two channels, of which the eastern, known as the Bab Iskender (Alexander's Strait), is 2 miles (3 km) wide and 16 fathoms (30 m) deep, while the western, or Dact-el-Mayun, has a width of about 16 miles (25 km) and a depth of 170 fathoms (310 m). Near the African coast lies a group of smaller islands known as the "Seven Brothers." There is a surface current inwards in the eastern channel, but a strong undercurrent outwards in the western channel. Aden, among South Arabian kingdoms, in the third century C.E. The straits of Bab-el-Mandeb were probably witness to the massive emigrations that took place out of Africa some 85,000 to 75,000 years ago. Mitochondrial DNA studies have now established beyond doubt that the first humans lived in the African continent and subsequently populated the rest of the world through a series of emigrations, beginning with the crossing of these straits. 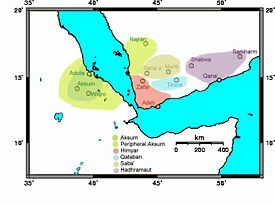 The Gulf of Aden has been a part of world trade since ancient times. Arab and Indian sailors had taken advantage of seasonal monsoon winds, and ancient Greeks also made the trip. Roman sailors started using the Red Sea route to Asia following the conquest of Egypt and expanded the quantity of trade involved, enough to justify a handbook of trade routes entitled Periphus maris Erythraei. The Erythraean Sea, as it was known then, encompassed the Gulf of Aden and Indian Ocean, in addition to the Red Sea. Few traders rounded the Horn of Africa and traversed the Gulf of Aden to continue down the coast of Africa, however. The route to India was faster and more lucrative. But trade between the Sabeans at the tip of the Arabian Peninsula and the budding civilizations of Africa predated Roman times. The series of kingdoms in southern Arabia culminated in the kingdom of Saba, which was responsible for a number of innovations in agriculture, including irrigation and use of the ox-drawn plow. The plow is believed to have crossed the Gulf of Aden to Ethiopia, and the Sabean influence on Ethiopia's language is unmistakable. Inscriptions found in the Ethiopian highlands and dated to the seventh century B.C.E. are deemed Sabean in style and content. The developing kingdom of Axum, centered in the Ethiopian highlands, absorbed these elements of civilization. 1939 stamp of Mukalla on the Hadhramaut coast, about 500 km east of Aden, in what was then the Aden Protectorate. Kathiri state of Seiyun, 1942. Seiyun is about 160 km inland from Mukalla. Aden is a city in Yemen, 105 miles (170 km) east of Bab-el-Mandeb. Its ancient, natural harbor lies in the crater of an extinct volcano that now forms a peninsula, joined to the mainland by a low isthmus. This harbor, Front Bay, was first used by the ancient Kingdom of Awsan between the fifth and seventh centuries B.C.E. The modern harbor is on the other side of the peninsula. Aden now has a population of about 590,000. Aden encloses the eastern side of a vast, natural harbor that comprises the modern port. The volcanic peninsula of Little Aden forms a near-mirror image, enclosing the harbor and port on the western side. Little Aden became the site of the oil refinery and tanker port. Both were established and operated by British Petroleum until they were turned over to Yemeni government ownerships and control in 1977. Aden was the capital of the People's Democratic Republic of Yemen until that country's unification with the Yemen Arab Republic, when it was declared a free-trade zone. It gives its name to the Gulf of Aden. The port's convenient position on the sea route between India and Europe has made Aden desirable to rulers who sought to possess it at various times throughout history. It fell on hard times when new shipping practices bypassed the port and made the daring direct crossing to India in the first century C.E., according to the Periplus of the Erythraean Sea. The same work describes Aden as 'a village by the shore', which would well describe the town of Crater while it was still little-developed. There is no mention of fortification but at this stage, Aden was more an island than a peninsula as the isthmus was not then as developed as it is today. Arab historians attribute the first fortification of Aden to the medieval period. The aims seem to have been keeping hostile forces out and maintaining revenue by controlling the movement of goods—preventing smuggling. In 1838, Sultan Muhsin bin Fadl of the nearby state of Lahej ceded 75 square miles (194 km²), including Aden, to the British. The following year, the British East India Company landed Royal Marines at Aden to occupy the territory and stop attacks by pirates against British shipping to India. The port lies about equidistant from the Suez Canal, Bombay (Mumbai), and Zanzibar, which were all important former British possessions. Aden had been an entrepôt and a way-station for seamen in the ancient world where supplies, particularly water, were replenished. In the mid-nineteenth century, it became necessary to replenish coal and boiler water. Thus, Aden acquired a coaling station at Steamer Point. Aden was to remain under British control until 1967. 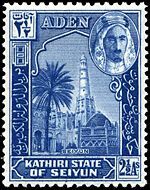 Until 1937, Aden was ruled as part of British India and was known as the Aden Settlement. 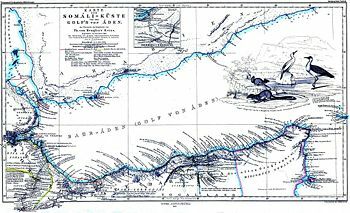 Its original territory was enlarged in 1857 by the island of Perim, in 1868 by the Khuriya Muriya Islands, and in 1915 by the island of Kamaran. In 1937, the settlement was detached from India and became a British crown colony. After the loss of the Suez Canal in 1956, Aden became the main base in the region for the British. To stabilize Aden and the surrounding Protectorate from the designs of North Yemen, the British attempted to gradually unite the disparate states of the region in preparation for eventual independence. On January 18, 1963, the colony of Aden was incorporated into the Federation of Arab Emirates of the South, against the wishes of much of the city's populace, and the Federation was renamed the Federation of South Arabia (FSA). An insurgency against British rule known as the Aden Emergency began with a grenade attack by the National Liberation Front (NLF) against the British High Commissioner. In 1964, Britain announced its intention to grant independence to the FSA in 1968 but that the British military would remain in Aden. In January 1967, there were mass riots by the NLF and the rival Front for the Liberation of Occupied South Yemen (FLOSY), which continued until mid February, despite the intervention of British troops. On November 30, 1967, the British finally pulled out, leaving Aden and the rest of the FSA under NLF control. Aden became the capital of the new People's Republic of South Yemen, which was renamed the People's Democratic Republic of Yemen in 1970. 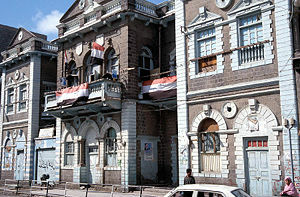 With the unification of northern and southern Yemen in 1990, Aden was no longer a national capital but remained the capital of Aden Governorate, which covered an area similar to that of the colony. On December 29, 1992, Al Qaeda conducted its first known terrorist attack in Aden, bombing the Gold Mohur Hotel, where U.S. servicemen were known to have been staying en route to Somalia for Operation Restore Hope. A Yemeni and an Austrian tourist died in the attack. Members of al Qaeda attempted to bomb USS The Sullivans at the port of Aden as part of the 2000 millennium attack plots. The boat that had the explosives in it sank, forcing the planned attack to be aborted. The USS Cole bombing occurred in Aden on October 12, 2000. 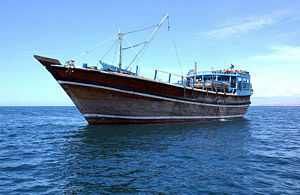 Dhow in Gulf of Aden, April 30, 2005. A dhow, whose origin is Arabia, is a little wood-made coaster. Artisanal fishermen have fished the region’s waters for thousands of years in a sustainable manner and in many places continue to do so with few advances in technology. These fishermen have established forms of traditional management of their resources, including the rotation of fishing activities among reefs to prevent over–fishing and decline of stocks. An extensive knowledge of the sea, fishing techniques, and habits of species caught by fishermen are retained by a few individuals who serve as leaders in each fishing community. In a few places the tradition of pearl diving continues, although the number of divers is dwindling. This part of the region’s cultural heritage is at risk of disappearing in some localities as local fishermen are replaced by foreign workers, prices for fish fall, and competition with industrial fisheries grows. In the 1800s, Aden grew as a ship fueling port, holding stocks of coal and water supplies for the early steamers. Port services expanded after the Suez Canal opened in 1869, and Aden grew to become one of the busiest ship bunkering and tax-free-shopping and trading ports in the world by the 1950s. Barges took cargo between ships berthed in the Inner Harbor and the wharves. Coastal vessels and dhows carried cargoes to and from regional ports. In the 1970s, with the Suez Canal closed until 1975, Aden declined under intense competition from new ports in the region and changes in the patterns of trade. New quays were urgently needed at Aden to serve modern cargo demands. These were built at the end of the 1980s. After over 150 years of commercial activity, Aden finally had the capacity and equipment to handle all types of dry cargo at deep alongside berths served by modern container cranes. Since unification in 1990, significant and positive changes in Yemen are leading to rapid privatization, higher investment, and growing manufacturing output to meet national and overseas demand. The advantages of Aden for container transshipment have been recognized. To handle the world's largest container vessels, the Aden Container Terminal (ACT) at the North Shore of Aden's Inner Harbor was designed and built. This facility, commissioned in March 1999, provides the port with world-class container-handling facilities. ACT's throughput is expected to increase. In 2007, a developer based in Dubai announced plans to build a bridge across the Bab el Mandab strait between Yemen and Djibouti, using an American construction firm. The stated goal is to create economic opportunity and stability on both sides of the Red Sea by tying in the bridge to new rail and road construction hubs and networks in Africa and the Arabian Peninsula. The president of the company given the contract has said, "It is very, very critical to connect the African nations and their products and crops right to the Middle East. The Middle East is extremely wealthy in money and oil, but we lack quite a lot of crops and services. If you open up this [transportation system that provides access into the heart of Africa] then you can create jobs by moving products, moving services. You can ignite economic development just by the transportation element. The bridge is really critical." Several factors threaten the region’s richness and biodiversity. Today, supertankers cruise this historical trading route, transporting oil and other dangerous cargoes around the world, with the potential for accidents that might release oil or other toxic chemicals into the marine environment. Those waters, with their unique habitats and their animal and plant communities, are thus placed in increasing jeopardy as a result of oil and effluent pollution. 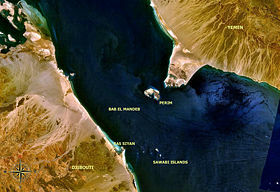 As to navigation risks involved, coral reefs form natural barriers to ships traveling through the Red Sea on their way to or from the Suez Canal. The coral is so extensive in some areas that only narrow channels remain, which can be quite hazardous. Many southern harbors are partially blocked by reefs. The ever-presence of oil tankers in such routes increases the risk of a disaster to happen if one of them hits a coral reef. This leads again to the ever-present threat of pollution by oil, sewage, and chemical effluents. Humans also pose another threat to marine life in the region. Fishermen, for instance, tend to catch turtles for their meat and eggs. Local recreational use of beaches in some areas also results in disturbing or even killing nesting turtles. The shark resources of the region are heavily fished. In some places, there is growing evidence of depletion, which is attributed to a lack of control over national shark fisheries and illegal fishing by fishermen who also catch sharks using gill nets and long-lines, thus causing damage to coral reefs. Furthermore, illegal fishing by vessels operating outside their natural waters is commonplace. The absence of effective control, surveillance, and enforcement of regulations has resulted in widespread poaching and habitat destruction by foreign and national vessels. There is also the problem of national over-exploitation as well as concentration of fishing within limited waters, which leads to a reduction in the number and diversity of fish as well as habitat destruction in some cases. Industrial activities and urban development also pose threats to the region’s marine life in the form of industrial and urban pollution, waste disposal, surface and ground water usage, and saltwater intrusion to aquifers. Agriculture also threatens the marine environment through increased sedimentation and the potential pollution from pesticide and fertilizer residues. All the above mentioned threats could lead to habitat destruction due to coastal development, pond construction for shrimp and fish culture, mangrove destruction, damage to coral reefs through unsustainable fishing practices, removal of coral for the tourist trade, and physical damage caused by tourist divers. All links retrieved July 19, 2017. Encyclopædia Britannica. Gulf of Aden. World Atlas. Gulf of Aden Map. History of "Gulf of Aden"
This page was last modified on 20 July 2017, at 00:02.